The default chart created by Excel is relatively plain. Each series is represented by a single color. In this tutorial, we look at how one can improve the presentation of a chart. In some ways, this is the easiest to accomplish. Double-click the plotted series. In the Format Data Series dialog box, click the Patterns tab. Select the Fill Effects... button. The effect on the right is the result of a Gradient setting of Preset and the preset selection of Early Sunset. Experiment with the final effect by changing the 3-D perspective (Chart | 3-D View...) Also, customize the floor and wall formats by double-clicking on each and choosing an appealing setting for each. The horizontal lines in the chart on the right are gridlines. 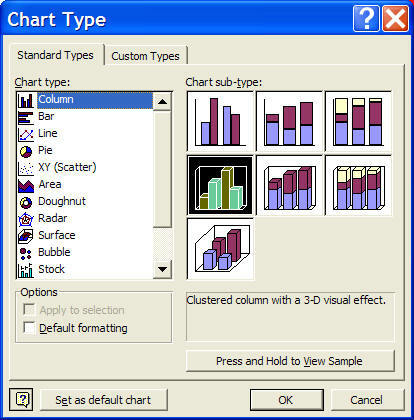 Delete them with Chart | Chart Options... | Gridlines tab or customize them by double-clicking on one and adjusting the color and type settings. In the Fill Effects dialog box, select the Picture tab, and click the Select Picture... button. Browse to the appropriate folder and select the desired image file. The other method is sometimes more convenient, especially when dealing with clip art images. It relies on an undocumented capability of Excel. Copy the image of interest (either in Excel, in the Clip Art Manager, or in some other program). Select the plotted series in the chart. Paste with CTRL+v. Repeat the steps below for each column. Select and copy the image of interest. 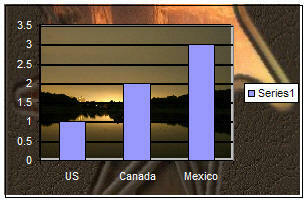 Select the chart, click on the plotted series. This will select all the columns. Pause and click on the column that corresponds to the copied image. This will select just the one column. Paste the copied picture with CTRL+v. Once done with all the columns, experiment with how the image is shown within the individual bars. Double-click the bar (just the one bar, not the entire series). In the Format Data Point dialog box, select the Patterns tab, then click the Fill Effects... button. In the Fill Effects dialog box, then the Picture tab. Towards the left bottom are three Format options: Stretch, Stack, or Stack and scale to X units/picture. Try them out. 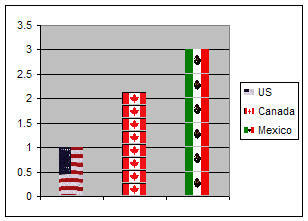 On the right, the US flag is Stretched, the Canadian flag is Stacked and the Mexican flag is Scaled to 0.5 units / picture. Also note that the legend that read Series1 in each of the above examples, now identifies each data point uniquely. This duplicates the contents of the x-axis labels. The example on the right deletes the axis labels (Double-click the x-axis. In the Format Axis dialog box, select the Patterns tab, then set the Tick Mark Labels to None. The example to the right combines the 3-D effect with a customized image for each data point. Each image was stacked and the gridlines were removed. It is possible to set both an image for the chart area and for the plot area as shown on the right. Of course, since the plot area is enclosed in the chart area, its smaller image is embedded in the larger image of the chartarea. Note that the axis have been reformatted to use a white color font rather than the default black. Not all charts are created equal. 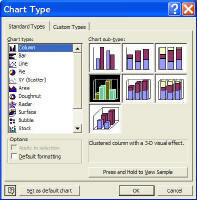 Excel supports different types of formatting for different types of charts. What works for a column chart may not be meaningful for a line chart or a XY scatter chart. In addition, the use of combination charts requires Excel to further constrain the formatting options. This tutorial demonstrated how one can custom format a chart. Try the ideas and techniques on your own chart. If Excel can support what you want to do, it will. If not, try something else.